Cupertino residents are a few short days away from Election Day. Cupertino Today reached out to the eight candidates running for City Council and asked them to gives us their “closing argument.” We asked them: Why should the residents of Cupertino vote for you on Election Day? Over the last several weeks, my family, my supporters and I have been knocking on your doors and having good, meaningful conversations with many of you. It has been gratifying to hear you acknowledge my work of the last several years and encourage me to continue. Many of you know me – I am a community volunteer. After my daughter graduated Cupertino schools and headed for college, I had more time to give back to this wonderful community that has been our home for over 23 years. In 2014 I ran for City Council on a platform of Youth, Environment, and Seniors. I am happy to report significant progress on those areas. I served as your Mayor in 2017. I was also elected to the Board of VTA in 2016. In those roles I was able to advance several transit, senior housing and clean energy solutions. My focus in my second term will be on Transportation, Housing, and Environment – building on the momentum from my first term. Our city needs elected leaders who can work on practical, near and long-term solutions to tackle these issues. We need elected representatives who have proven they build consensus to create regional solutions. Over the past 4 years I have consistently demonstrated my ability to do exactly that. Visit www.Savita4Cupertino.com to read more. I ask for your vote again on Nov 6, 2018. Together, we can make progress. Let’s keep Cupertino the relevant place that we all know and love to call our home. Cupertino voters can visit my website to have a full sense of my approach as Cupertino’s Mayor this year and as Councilmember for these past four years. It’s www.darcypaul.org. I have worked for good government. Much like our community’s general disposition, I do the work and spend more time thinking about how things can be improved rather than thinking about how to self-aggrandize. Cupertino voters are smart. They can and will make good decisions. With over 26 years of experience in providing business to Cupertino and California, I will offer a new Vision to the residents of Cupertino that will include new business while continuing to maintain a high level of living. It is imperative to continue our growth in Revenue, while offering a Superior level of Education, and Safety/Security. I will also institute Beautification programs that make our City the most Beautiful City in the State of California. I love this City and respectfully request your Vote. With 20+ years of community volunteering and 11 years of high school board service, I have proven track records to earn the trust of Cupertino residents that I have “heart, brain, and courage” to move Cupertino forward for generations of youth and family to live, work, and enjoy. My guiding principles are integrity, compassion, and logical reasoning – I am not in any developer’s pocket. Vallco Specific Plan is certainly not perfect, but it does bring tremendous community benefits, inclusive housing, and economic vitality. To resolve traffic woes, I will seek collaboration with major employers and neighboring cities to bring regional transit into Cupertino that connects job and housing, while, in parallel planning, providing inclusive housing options for teachers, nurses, and working families. I have proven leadership and collaborative skills to bring solutions to transit and housing issues. And I also have experience in enhancing the quality of education through collaboration between the city and both school districts. Choose Hung Wei for real results that benefit Cupertino residents. Cupertino is threatened by traffic gridlock, crowded schools, housing affordability crisis, and environmental degradation. The root cause is city government enabling overwhelming development. I’m a champion for Democracy and Sensible Growth, keys to maintaining our quality of life. Using my professional skills, I have presented dozens of data driven analyses on development to the city that demonstrated failings in proposed mega developments. I’m a leader in the Better Cupertino grassroots organization of neighbors. Sensible Growth is crucial and balances the many aspects of our community. We should not let developers’ interests dictate to us. The incumbents seeking reelection continue advocating for massive density projects. And several other candidates were/are vocal supporters of massive overdevelopment at Vallco, now 22 story buildings. I’m a 21-year Rancho neighborhood resident. My wife and I are a middle-class family that works hard so our children can attend CUSD schools. As a member of a family of veterans, I learned very strong ethics, the importance of Democracy, and to always do the right thing. Every vote I will cast will be for the majority. I want to hear from you. On the Council I’ll serve you. Sincerely, Jon Robert Willey www.Jon4Democracy.com. Many of you know me as I was on the City Council before and was your Mayor twice. I thought that my public service was done, since I have no ambitions for any other public office. However, as a 49 year resident of Cupertino, I care about this City and have become very concerned about the possible direction and civic tone of a future City Council. While on the Council in the past, I worked with a wide variety of viewpoints and personalities, but we listened to the staff, received public input, and usually compromised and reached consensus on key Cupertino issues. We always did what we thought benefited the residents and the City, balancing the benefits to the City as a whole while minimizing impacts to any affected areas. Compromise and consensus seems to be a lost art in government today. If elected, I am ready and eager to work together with my fellow Councilmembers to have fact based discussions and achieve resolution of key issues to move Cupertino forward and create a better place for all our residents to live, work, and play. The political division in Cupertino is destroying our community and negatively affecting our quality of life. This election, we can reelect the status quo or choose those who will push back against rampant corruption by changing the corrupt political incentive structure with a solid plan to reduce the influence of big money in our politics and restore trust in our city. As a lifelong resident of Cupertino and product of Cupertino public schools, I am acutely aware of the issues facing our community and the reality that folks in Cupertino have completely lost faith in their government. To regain the community’s trust, I will work hard as your Councilwoman to implement reforms to restore transparency and community engagement in our government, help secure approval and funding for twenty-first century transportation infrastructure, approve housing and development that meets the needs of our community, not special interests, and take serious action to address our climate emergency. As a City Council Legislative Staffer I have proven experience addressing our historic housing crisis, tackling climate change, implementing traffic mitigations, realizing safety improvements, and much more. I currently serve on the Friends of Deer Hollow Farm Board of Directors and the Silicon Valley Clean Energy Customer Advisory Group where I’m passionate about preserving our local greenspace and protecting the health of our community. I have also been involved and worked professionally on state, local, and national causes as a Community Organizer. I ask for your vote so, together, we can secure Cupertino’s future. Thank you. Cupertino is at a critical crossroads. Suburban atmosphere versus hyper-densification. Do we want balanced growth, or more office space in exchange for token benefits? No more Councilmembers who collaborate mostly with developers and special interests, while leaving the residents in the dark. No more Councilmembers who say they care, then rubberstamp whatever projects proposed. No more Councilmembers who say they care about schools, but reduce school benefits to fund pet projects. No more. We need Councilmembers who believe in grassroots democracy, and ask tough questions to keep the city staff, developers and polluters accountable. We need Councilmembers with a track record of government oversight. As a school board member, I quickly turned things around and brought many positive changes by resolving long-standing issues, including hiring a new Superintendent, better use of technology, and reducing administration. Leaders from all three employee unions endorsed Liang for City Council. I’ve earned the trust and respect of both parents and staff. I believe in evidence-based decision making after effective community engagement. Cupertino is at a stalemate for the revitalization of Vallco because the Council has allowed for more office space, resulting in a tug of war against everyday hardworking residents who value quality of life. The challenges we’ve faced have awaken and united residents. The revitalization of Vallco will move forward with a Council who genuinely respects residents and only accept projects that benefit the City and its residents. We, the People, should be the drivers of our future. Vote for #1 Liang Chao. 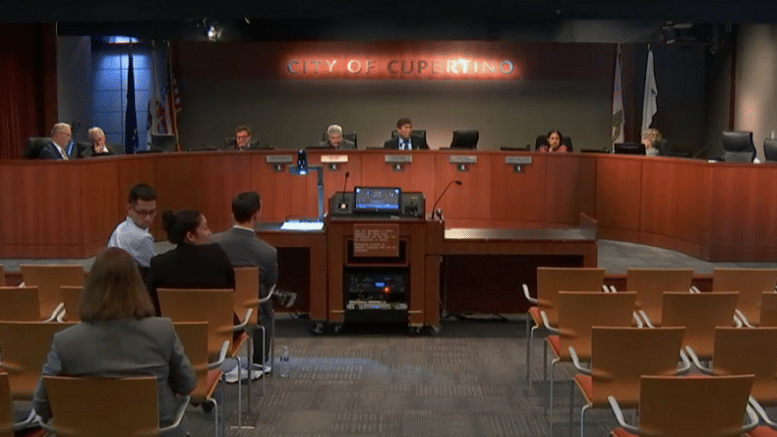 For more information about the Cupertino City Council election, click here. 1 Comment on "City Council candidates make their case as Election Day nears"
We cannot have a dead mall in the center of town. Any candidate who is not for renewal of that space into a vibrant mixed use community, will not get my vote. Frankly; I am disgusted by a small but vocal group known as Better Cupertino treating our town as their personal sandbox.